With Bacow’s tenure as the president of Harvard University nearing the close of its fifth month, his approach to deciding when and when not to speak out on various issues is becoming more clear. Overall, he has chosen to be vocal on issues directly affecting Harvard but nuanced and reserved on more general political issues in order to foster debate. 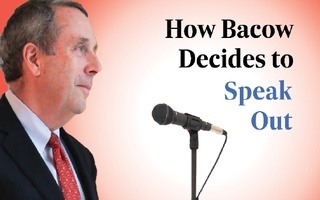 Although it is too early to predict how Bacow’s choices on when to speak out will play out over the course of his presidency, we support his full-throatedness in speaking out on issues that directly affect the University. Bacow seems to be determined to defend the University when its long-standing values are challenged. For example, Bacow has been very outspoken when it comes to the current admissions lawsuit. He has clearly delineated his stance on the admissions trial by sending emails expressing his support of Harvard’s affirmative action policy to students and alumni. While he tended to refrain from commenting on the intricacies of the trial, he staunchly defended Harvard’s overall admissions policy and the financial aid program. We are heartened to see Bacow not being afraid to take a firm standing on Harvard-related issues, while at the same time being considerate of diverse opinions. This demonstrates his commitment to balancing perspectives, which he has made clear. 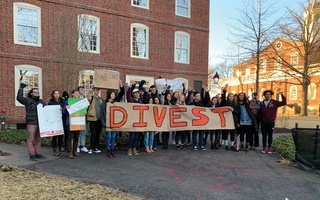 Bacow also chose to speak out against divestment from the fossil fuel industry and the prison-industrial complex. He upheld the stance of his predecessors, arguing that Harvard will not use its endowment to achieve political goals. 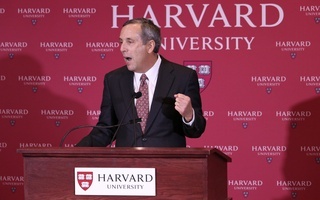 In this regard, we believe Bacow has made the right choice communicating the University’s position on critical issues affecting Harvard. For issues that affect the University less directly, however, Bacow has been less outspoken. 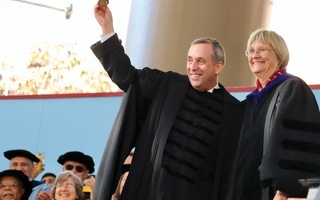 He has admitted as much, saying that his leadership philosophy entails speaking out on issues “that are central to the institution, or [about which] the institution has had a long-standing point of view.” Should Bacow wish to speak out on issues that are less central to the University, he has great leeway to do so and significant weight in his words. There is precedent for such an approach. Former University President Drew Faust addressed issues of national import — for instance, the Deferred Action for Childhood Arrivals program, which does not affect Harvard’s administration so much as members of its community. Faust spoke in favor of the program. Like Faust, Bacow should choose deliberately when to leverage the University’s influence. Given that Bacow has only led Harvard for a semester, the legacy of his role as an advocate is far from finalized — and we wish him the best as he continues to determine it.